I've been dreaming of Australia this past week. 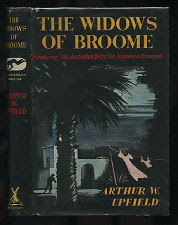 I'm listening to Arthur Upfield's novel The Widows of Broome on my i-pod. So, as I did housework, or pedaled my exercise bike, I listened to the lovely, gravelly tones of Peter Hosking read Upfield's book. I do love an Australian accent, and Peter Hosking's voice is wonderful. Sigh. If I ever actually see the man, I will undoubtedly be disappointed. His real life image could never match the picture I have of him in my head. So, yeah, I've been dreaming of Australia, and of Broome in particular. The Widows of Broome isn't the best book I've ever read. Arthur Upfield's novels are not great literature. But the mysteries, although a bit slow, are quite interesting. Upfield travelled extensively throughout Australia, and his portrayal of the outback in the early part of the twentieth century, both the landscape and the people, is what makes his books interesting to me. I do admit, though, that his depiction of Australian aboriginals, and the casual and endemic racism which they were subjected to, is disturbing, even if it is historically accurate. 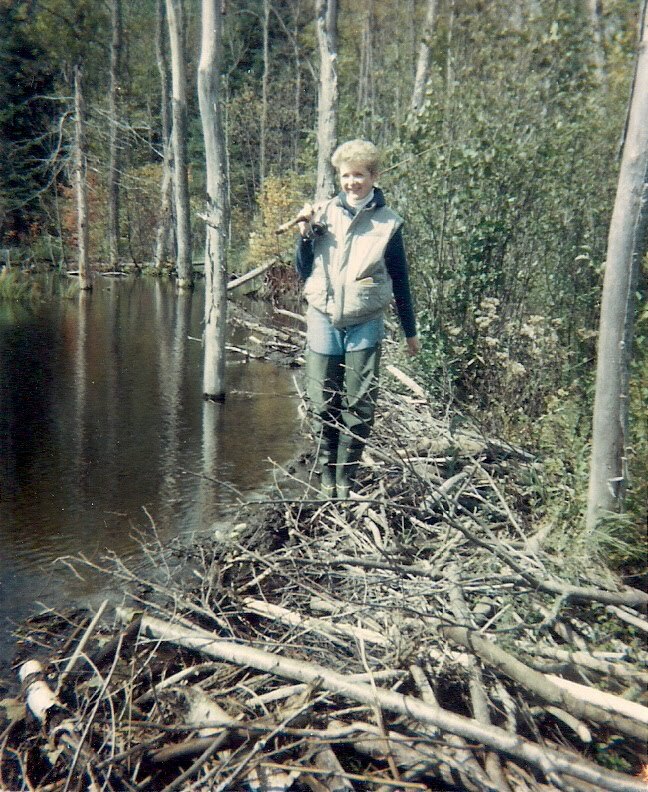 I know that might sound a bit hypocritical in light of the challenges faced by First Nations people right here at home. But I don't want to go down that particular rabbit hole right now. I want to talk about Australia. Hubby and I have been to Australia twice. And I adore reading books that take me back to places I've already been. On our second trip in 2008, we drove almost the entire length of the coast of Western Australia. From Perth, south to Esperance, then inland to Kalgoorlie and the goldfields, and then back north again. All the way to Broome. For days we followed the long and definitely not winding road. At times, our only stop all day was a roadhouse like this one below, for coffee. On the map, the only dot on the highway for kilometres might not be a town, but a roadhouse. A tiny dot a long, long way from any other dots. Drivers can be mesmerized by the very long, empty, and unbending road, and lulled into inattention. After one coffee stop, just as I was about to hand Hubby his cup, a huge emu lurched onto the road in front of us. Hubby jerked the wheel. Cursed. And then muttered, "Well, that was interesting. You don't know what driving in the outback is until you've stared up at the undercarriage of an emu at 140 clicks." We stayed for several days in Exmouth. We swam and snorkeled at Turquoise Bay, in Cape Range National Park. Hiked in Mandu Mandu Gorge. Saw wallabies, lots of lizards and birds and many, many flies. Hence the head net. And we were awakened at five each morning by flying alarm clocks. These noisy cockatoos landed on the roof of our cabin every morning while we were in Exmouth. ... then it was on to Point Sampson, and Port Hedland (yuk... its nickname is 'brown town'), and then beautiful Eighty Mile Beach (where we attended a moving Anzac Day ceremony at dawn on the beach, which I wrote about in this post, and where, even with 80 miles of beach, there was no swimming.) You see, we'd discovered that, in Australia, one does NOT just stop at any likely looking beach and go swimming as we had once dreamed. Too many jelly-fish, stone fish, salt water crocodiles, rip tides, undertows, and whatever. Case in point... this was our conversation as we checked into our lovely cabin in Point Sampson.... Me: Do you have a beach where it's safe to swim? Clerk:Yep. But you might want to wear shoes into the water. There's blue ringed octopus. They hide in the rocks. Me: Oh? What do they do to you? Clerk: Kill ya. Me: Do you have a pool??? And eventually, after many days and many, many kilometres we came to Broome. According to Lonely Planet, "Aussie's get a dreamy, faraway look in their eyes at the mention of Broome." Yeah, well.... now we know why. Beautiful, tropical beaches. Like Cable Beach below. That's Hubby riding a wave to shore. A lovely frontier style town. With resorts that look like corrugated iron-roofed sheds, but aren't. A museum that relates Broome's rough and tumble past, built on the pearl industry, and all the greed and cruelty that entailed. A cool little pedestrian mall called Johhny Chi Lane. And pearl shops galore. Broome pearls are famous...and pricey. Hubby bought me a beautiful "champagne" pearl. That's me below shopping in the market at the courthouse. 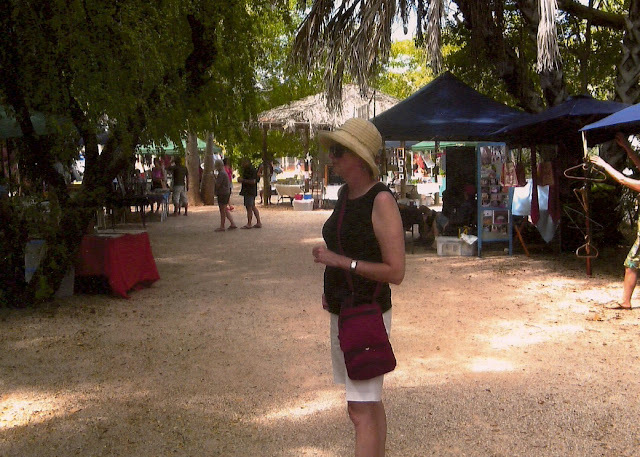 There were tons of stalls with crafts, food, and art. And between the stalls... one ginormous boab tree. And sunsets. Broome has the most beautiful sunsets we'd ever seen. And a wonderfully laid back, slow paced, have a beer and watch the sunset kind of vibe that suited us down to the ground. And of course let's not forget sunset camel riding. You can't go to Broome and not go on a sunset camel ride. Yep, we loved Australia all right. And we saw a lot of it over the course of our two trips. But Broome was special. We adored Broome. Every time I mention the name, Hubby still sighs and says, "Gosh, I loved Broome." And ever since we came home from Australia, I've loved reading books that are set there. Like Dirt Music by Tim Winton. Dirt Music, set in coastal Western Australia, in Broome, and in the wild and remote region known as The Kimberly, might not be everyone's cup of tea. It's pretty gritty. But then Western Australia, outside of Perth that is, is pretty gritty too. And surviving there, making a life, isn't for the faint of heart. Have a look at this review by Peter Porter in The Guardian. My favourite Australian mystery writer is Peter Temple. 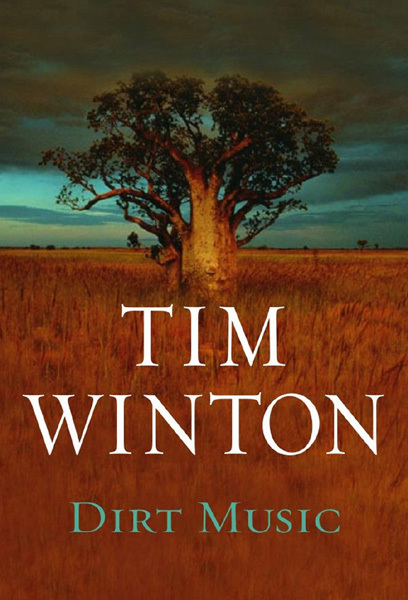 His books aren't set in Broome or even in the west. 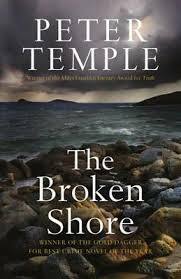 The Broken Shore, my favourite of his novels, is set in rural Victoria, south of Melbourne, along the famous Great Ocean Road, with its "iconic jagged coastline", where, as one reviewer puts it, "the shore is not all that is broken." You can read that review for yourself here. Temple is a superb writer. His plots are gripping. And I think you'll love his depiction of Victoria's down-at-heel towns that have seen better days, and his down-a-heel characters in all their flawed glory. At least I know I did. Hubby and I love the grandeur of Australia; even the most desolate parts have their own beauty. We're fascinated by the vast array of plants and animals that are so very different from here. And by its history and culture. And language. I mean, I know it's supposed to be English... but even Australians themselves couldn't tell us why they call sausages "snags." And believe me we asked this question many, many times. But, I think part of the appeal of Australia for us, in particular small town and rural Australia, is its utter lack of pretension. One night on our way to Broome, somewhere north and east of Exmouth, I can't remember what town, we stopped into a tiny local grocery/liquor store. I wanted to buy a bottle of wine, thinking of having a nice glass before dinner. I picked up one of only four or five on the shelf and gasped at the price. I held the bottle up and said to the young clerk, "Wow. That's really expensive, isn't it?" She just shrugged and said, "Yis 're in the Kimberly now." I felt like a pretentious twit as I put it back on the shelf. And my lesson learned, I had a nice cold beer with my supper, instead. What are you reading... and dreaming of these days? Point well taken about not venturing into the water without checking first whether it's safe. Had not thought about that. Since my daughter just moved to Australia, I will let her know to follow the locals, not wanderlust alone. Fun pics! Yes.. do tell her to be careful. We heard too many tales of tussles with stone fish and jelly-fish to take the warnings lightly. Oh yes, loved Dirt Music! So glad you love my country, hope you make it back some day! Me too, Bodie. We never did make it the Northern Territory. And I'd love to see Melbourne and Sydney again. The last book I read was Small Island by Andrea Levy . A prize winner when it was published a few years ago . Set in Jamaica & UK in the 1950s , it tells the story of two immigrants arriving here to suffer resentment & racism . The four main characters are all flawed but as the author tells their individual stories it becomes clear why & changes the way you feel about them . When the book finished I wanted to know what happened next . Have you read it ? We never got to Australia , which is a great favorite with Brits . Not sure why we didn't go , perhaps the length of the flight , we got very weary of long flights , perhaps those long straight roads but you make it seem very appealing . We are on holiday in Pembrokeshire , Wales just now - one of our favourite little corners of the UK . Enjoying walking along its wonderful coastal path & watching our dogs run amok on the beaches . I have not read Small Island.... and ironically I picked it up at the library last week and put it back on the shelf. I will definitely read it now. I would love to go back to the UK again. I'd love to see Wales, and Cornwall.... and Bath.... and Yorkshire again. So many places to visit... one has to make a priority list. Always enjoy your posts about books and reading. I have read some excellent authors that you have led me to. Thank you. You're welcome, Christy. Thanks for reading. I've always wanted to see Australia but let the long flight change my plans to closer locations. It looks like you had a blast. Thanks for the book recommendations. I rarely listen to novels on my audible but I should. They'd be WAY more fun while doing mundane things. Happy Monday! Love it! My greatest dream is to one day see Australia. Have to convince Husby first . . .
Good luck with the convincing, Diane. New Zealand was wonderful too...in an entirely different way. I'd love to go to Bath. Or as Jane Austen's character Lydia might say..."I long to see Bath." Or was it Lime? Or both? As if the emus and pearls and boabs weren't enough... Camel riding! What an extraordinary adventure. Sadly I am not reading much these days... I miss reading terribly when there simply isn't time. 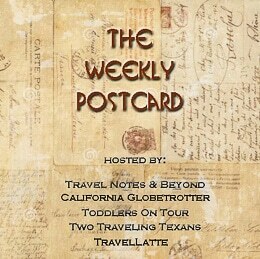 I stumbled across your blog in the last couple of days and read with interest your Oz adventure . 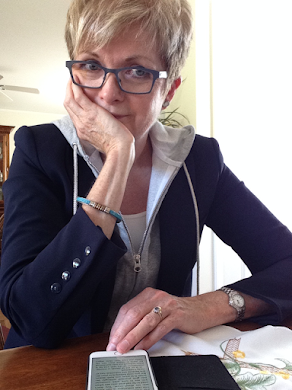 I am English married to an Australian from Melbourne . He has always referred to sausages as 'snags' or 'mystery bags'. He could not tell me the origin of snag but I have found on a website called british expats.com a very logical and plausible version . The word 'snag' derives from abattoir workers and stands for Skin , Nuts and Gristle which is all that is left of most animals after butchering . In Australia , sausages are also sometimes referred to as 'Butchers shop floor snags' , which dates back to when all butchers shops had sawdust scattered on their floors to soak up blood and any offcuts etc that found there way there during the day . Hence ' mystery bags ' is also derived from probably that same background . You may also be amused or disgusted to know that a lot of older Australians refer to the Great Australian Meat Pie ( beef mince and onion in gravy in a pastry crust ) as a "rat coffin ' , which I feel is quite self explanatory . I hope this helps you out with one or two Australian colloquialisms. I look forward to reading more of your blogs in the future. Wow. Thanks for that. Mystery solved after seven years. Trust me we asked everywhere we went. At one tourist bureau the two ladies behind the counter were busy researching it on the net when we left. Finally one day when we had passed yet another "Ute" with the metal bars over the front bumper we were told were referred to as "roo bars"...I had a moment of inspiration. I said to Hubby, "I know. Snags are when something gets snagged on those roo bars and they take 'it' home and make sausages out of it." Well, we had a good laugh, anyway. We laughed all afternoon at your explanation, which makes perfect sense. Hubby particularly likes "rat coffin." Those Aussie's, eh? Never one to "mince" words. haha. We did the east coast on our first trip. So many things there that you really have to see. And we saved the lesser know places for our second trip. Loved them both. What a lovely post. I enjoyed every sentence. Like you I love Broome, The Kimberley region and the entire West Australian coast. We live in Sydney so it is only a 5 hour flight for us to get to Perth - not far at all. The flying alarms clocks you mention are corellas, a type of small cockatoo. They are positively quiet compared to the sulphur crested cockatoos we get in our garden in Sydney. I think you will find it has been a while, if ever, since anyone was killed by a blue-ringed octopus. They are supposed to be deadly but you would have to be pretty unlucky to get bitten. I think you were in more danger swimming at Cable Beach. We once spent five hours in Broome hospital after our son was stung by a poisonous jellyfish at Cable Beach. He had only been in the water for five minutes. If you like Australian literature I can highly recommend 'The Secret River' by Kate Grenville. It is set in early Sydney and is one of the best books I have ever read. Thanks, Lyn. Maybe that's why the clerk in the hotel seemed so blase about the blue-ringed octopus. We heard about the jellyfish at Cable Beach. Saw all the "stinger" medical stations on the beach. It's hard to avoid everything, isn't it? We have jellyfish here on the east coast... but not anything as dangerous as yours. I will look for that Kate Grenville book. I've read others of hers but not that one. Thanks.